Ruby, that's lovely! Thanks for sharing. I believe it would. And you would do the same to it. yay, I love good sewing tutorials. I checked out Ruby's blog- that looks like a good level for me- Thanks Ruby! love...love ! Your description of sewing levels for these bags. I will lean toward the easy. Thank You! I have been looking for a good weekender bag to make. Maybe I'll be brave enough to give this one a try. Thanks! Thanks so much for including my tutorial in your roundup! Thanks for the info. Love the ideas. I made the six-pocket bag -- it's adorable, but wee. My 3 yr old uses it for random toys. If I ever make another one, I'm going to size up the pattern. i'm digging the weekender! i definitely want to take a stab at it! 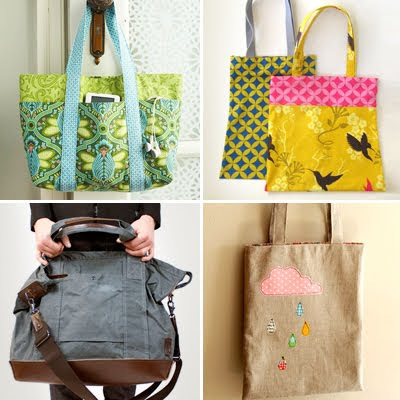 I'm lovin' the six pocket tote, but think I'd better start with the easy tote. By the way, I love the way the handles are so easily done on this design. Thanks for the pointer! I was planning to put my XMas gifts this year in tote bags instead of wrapping them. This is a lifesaver. Thanks. cool idea so adorable :) Thanks for sharing.